Review: 'The Breakfast Club' Live Reading With Jesse Eisenberg and Aaron Paul Director Jason Reitman staged his annual live reading of a film script at the Toronto International Film Festival on Sunday night. Aaron Paul, Jesse Eisenberg and Christina Hendricks stepped in. Rediscovering 'The Breakfast Club' With ... Jesse Eisenberg? 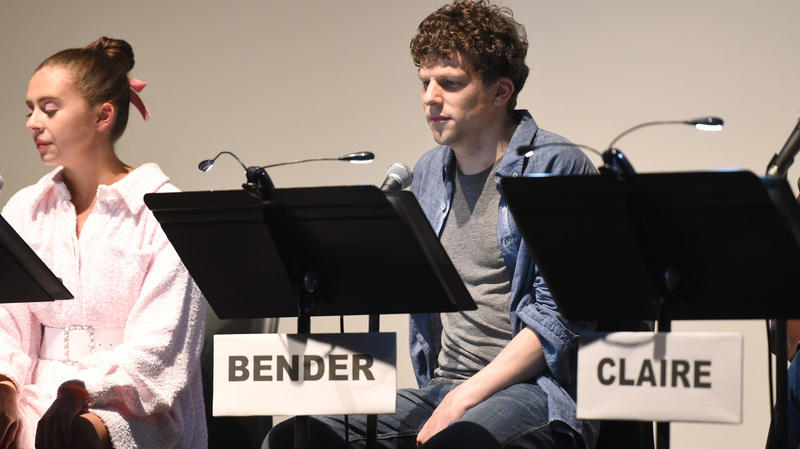 Bel Powley and Jesse Eisenberg appeared in Jason Reitman's live read of The Breakfast Club on Sunday night in Toronto. The first question was whether Jesse Eisenberg would make a good John Bender. Who, after all, does Jesse Eisenberg think he is? Sunday night at the Ryerson Theatre in Toronto, director Jason Reitman continued what's becoming his Toronto International Film Festival tradition by staging a live reading of a well-known film script. (He directed similar readings in Los Angeles for years.) Reitman brings actors who are at the festival to promote their new films, and he borrows them for an evening to sit on stage and reinterpret something that many in the audience know well. This year, it was The Breakfast Club, John Hughes' classic 1985 high school detention comedy-drama in which a popular girl, a great athlete, an oddball, a nerd and a rebel – played in the film by Molly Ringwald, Emilio Estevez, Ally Sheedy, Anthony Michael Hall and Judd Nelson – spend a day in the library together. There are massive caveats to real critiques of these readings: there's not a lot of time to prepare, casting is limited by who's around, and in a case like this, you have actors who are massively outside the age range for their young characters, even more than is often true in film. Furthermore, all the audience is getting is a script reading. There's acting going on, certainly, but it's much more an experiment than a completed piece. It's a work of nostalgia, an ethereal shape-shifting for actors, and a chance to hear lines you know in a new context and see how they sound there. In this reading, Ringwald's character, Claire, was read by Christina Hendricks, probably best known for her work as Joan on Mad Men. The jock was Aaron Paul (Breaking Bad), the oddball was Bel Powley (The Diary Of A Teenage Girl), and the nerd was Steve Zissis (HBO's Togetherness). Perhaps the most indelible character in the film, troubled "bad boy" John Bender, was read by Jesse Eisenberg. At first glance, this seems like hugely improbable casting based on the image of Bender that comes from the film. Where Nelson's Bender was lumbering, surly, shaggy and bellowing, Eisenberg's style – particularly but not exclusively developed in The Social Network – is a slender, controlled, and not physically aggressive way of being just as infuriating. Bender is drawn as a potential violent criminal whose anger is stretched thinly, barely holding in a bucket of insecurities; Eisenberg specializes in smug flatness. His guys tend to be more like potential white-collar criminals who insist they've spent their lives being picked on by guys like Bender. Eisenberg specializes in smug flatness. His guys tend to be more like potential white-collar criminals who insist they've spent their lives being picked on by guys like Bender. But boy, that switch in type was interesting. It might not have worked had it been done on film (even when Eisenberg was more age-appropriate); it would require a different aesthetic. The script is written to build to a release of anger that startles the other kids into realizing how bad Bender's life actually is, but Eisenberg snaps more than he hollers. Bender in the script issues a lot of threats, but Eisenberg's version of him didn't have a hint of true menace. Only contempt. And that contempt is very effective. Bender is, at heart, a guy who pokes and pokes at other people, trying to get them to pay attention to him, trying to get under their skins because he hasn't grown out of it. And that kind of hoodie-thumping parrying is Eisenberg's strength exactly. Needling the principal, making fun of the jock, refusing to take anything seriously? It fits. Specific dialogue about Bender's family situation aside, the Eisenberg take summoned a version of John Bender as a plugged-in product of privilege, a guy who's been able to act however he pleased all his life. That this, not being abused, was how he got to be such a jackass. This was Bender as a completely different kind of secretly terrified, conspicuously posturing bully. Compare that to Christina Hendricks, whose persona in television and film has very often been essentially a grown-up Claire: she plays a lot of pleasing, pretty, status-conscious women who are smart but aren't always credited with being smart. Even her red hair draws a dotted line between her and Ringwald, a sort of echo that can't fully resolve. What is Claire like in 20 or 25 years? Maybe like a Christina Hendricks character. Maybe the hardest role to make real in a reading is Allison, played in the film by Ally Sheedy and here by Bel Powley. It's no criticism of Powley to say that for much of the story, Allison largely exists in Sheedy's eyes, in her gestures and even her clothes. Never have I appreciated Sheedy's uneasy energy as much as when watching Powley try to bring her to life in a staged reading. Her abrupt romance with Andrew – the jock handled here by Aaron Paul – makes even less sense when you haven't gotten those unexpected shots where they make eye contact, when you don't get the little nod he offers when she says of her parents, "They ignore me." To her credit, though, Powley knew that there was one visual that the reading could not do without, so she sat there and made herself a Cap'n Crunch sandwich with Pixy Stix on top, right on the music stand that held her script. She gamely took a bite, to riotous applause. Speaking of Paul, at first I found his low-pitched take on Andrew's lines a little strange. He didn't present the jock as basically a nice-guy All-American, as Estevez did. Paul made Andrew sort of a self-styled James Dean, a man of few words but a man whose words must be heeded. This Andrew wasn't quite as much of a jerk as Bender, but he wasn't that far off. His declarations of how his level of drive is not understood by people who don't play sports sounded more annoyingly self-involved than they do in the movie. It's a version of the story in which jocks are as bad as you fear they are on the outside, even if — like everybody — they're just people on the inside. It's a version of the story in which jocks are as bad as you fear they are on the outside, even if — like everybody — they're just people on the inside. Despite the fact that some on Twitter speculated that Eisenberg would have made a more logical nerd than criminal, it made sense that Steve Zissis, an actor here for Reitman's Gary Hart film The Front Runner (in which he plays a rumpled journalist), played the nerd, Brian. Brian is not the Eisenberg kind of nerd — at least not yet. He's not the kind who's angrily lying in wait for when everyone will bow down to him because he's got a cool billion dollars. He's the kind of nerd who's deeply sweet but totally lost in high school, and Zissis gave him just the right tentative, searching awkwardness. In other words, Brian is the type of nerd who was referred to as a nerd in the '80s, not the kind we have now. The supporting cast came through, too. Was it great fun to hear Robert Wuhl ("Lollygaggers!") take on Carl the janitor, who tells the kids that he goes through their lockers? It was. Was it great to hear Richard E. Grant (here for the wonderful Can You Ever Forgive Me? with Melissa McCarthy) try to keep his British accent out of Assistant Principal Vernon's mouth? It was. There is something sad about seeing a product of your youth that you secretly know has not aged well revealed under the harsh lights of your own changed judgment. If you don't believe me, check out Ringwald's own piece in The New Yorker on the screwy gender politics of her John Hughes films, which politics made me cringe at a molecular level when they flared again and again during the reading. Hearing a contemporary actress like Hendricks submit to questioning about whether she's a "tease," hearing Reitman read the stage directions about Bender crawling under the desk and putting his head between Claire's knees, hearing Hendricks try to make Claire's sudden cry of surprise when he does something while he's under there into something funny ... it was hard to listen to. Particularly now, in these months, in this year, on this particular Sunday. Hard to listen to, indeed. But of course, so are the contemporary movies that still reduce women to wives and girlfriends only, that don't tell their stories, that treat them like teases and figure out ways to figuratively stick the camera up under their skirts. I would never forgive a contemporary film for the things that The Breakfast Club does, but I know just about every line. I knew where there were differences from the final film (they were reading the original script, not the shooting script). I know its flaws like I know all my own moles and verbal tics. It's imprinted on me somewhere — somewhere that I probably never even look until someone points it out to me. But it's valuable, and it's rare, to get a chance to really look at something familiar from a completely different angle, where your nostalgia is a special effect. Your own fondness for a story, and for a cast, can weave itself around a film like a cocoon that protects it, but also means you don't really see it anymore. It takes something intentional, something willfully disorienting, to really see it again. When I flew here to Toronto, I didn't have any wired headphones with me, and it's such a short flight that all I did was watch a movie with the sound off. I chose Ocean's Eleven, because I've seen it so many times that I don't have to hear anything anymore to know what they're saying. I watched Clooney say "Does he make you laugh?" and Julia Roberts say "He doesn't make me cry," and I read their lips, because I knew the lines. But watching it without sound, I also noticed the colors more than I ever had. I noticed how the scammers match the backgrounds where they're scamming, and how Julia Roberts appears in a red that doesn't belong in the casino where she also doesn't belong. I noticed how she then appears in blue that matches the blue in the art that she loves, and how you can almost tell she won't kiss Andy Garcia in that room, because of how he's dressed. He doesn't match her or the art, and when they don't kiss, it seems preordained. How could they, when he is not in blue? Sometimes you have to force your own perspective to shift. Who does Jesse Eisenberg think he is?, as Vernon might have demanded to know. He is a pretty good John Bender, as it turns out.